Everyone has something they would like an escape from, be it worries, work, stress, personal problems, or just the general day-to-day grind. That longing for freedom, and joy, and exhilaration could be as close as your friendly neighborhood stable. A ride on a horse is akin to no other feeling, and has actually been medically linked to improving both mental and physical health. As society has become more technologically advanced, the role horses play in society has dramatically changed. We have depended on horses as workers less and less, but at the same time we seem to need the emotional solace and physical support they can lend more and more. Stress is everywhere in today’s society, and aside from being unpleasant, there are many dangerous health risks associated with it. Stress-related heart attacks, anxiety, depression, and high blood pressure are on the rise nationwide. Suicide rates have risen, more people are on medication to help cope with their emotions, and many struggle to even get a decent night’s sleep. A barn may be just the place to go when searching for another way of facing these difficulties. There is an old joke stating that “horse people are stable people,” that may have more truth in than originally thought. Many studies, including one done in the UK, have shown that people who ride rate their emotional level as happier and more cheerful after riding. Those who ride also find that they become more depressed the longer they go without riding, but that a ride will increase their happiness and lower their stress levels. Many studies have shown the benefit of animals on improving heart health, lowering stress, and having a positive impact on depression. 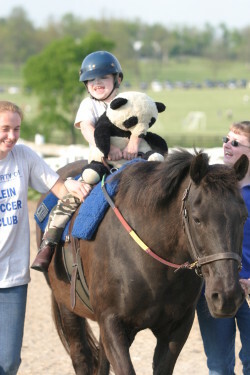 Many differently abled children, such as those coping with Autism, have also benefitted from working with horses. There are schools that take children in and teach them how to care for and ride horses, teaching them patience and responsibility, and lowering behavioral problems. New programs using horses to treat those suffering from PTSD (Post Traumatic Stress Syndrome), including soldiers returning from deployment, have shown great success. Prisons nationwide have programs through which inmates can learn how to gentle and train horses who are then used for mounted patrol officers. Officers have said that these prisoners are happier and better-adjusted than others prisoners who do not have access to these programs. It isn’t just our hearts and our minds that horses touch, however. Exercise and fresh air does everyone a world of good, but it can be hard to pry oneself off the couch for a dull walk around the neighborhood. A joyful, heart-pounding soaring ride around the arena, however? Much better. Many stables offer riding lessons for both children and adults, from beginners to intermediate riders. Horse-back riding strengthens your core muscles, improves your posture, and has been rated as a “moderate intensity” exercise. Horses bring many benefits to the lives of those around them. They are both beautiful to watch and of significant impact to the lives of many. They are a fun, enjoyable, different alternative to the daily gym grind for those who need more physical activity in their lives. They are a morale booster, a friend, and a teacher for those who are depressed, stressed, or lonely. Just because we no longer depend on them as a means to an end, does not mean their meaning in our life has ended. Horses still have an important health-related role to play in our everyday lives.People with physical disabilities can benefit from riding as a low-impact sport that is gentler on their joints and offers an enjoyable alternative to physical therapy in a gym. There are many different types of riding, so everyone can find the one that suits them. Many of the riders polled in the survey done in the UK were women (90%) and a large number were over the age of 45. Women are traditionally underserved in the sports arena, but horses offer them an opportunity to be competitive.